Scientists working with the Major Atmospheric Gamma-ray Imaging Cherenkov (MAGIC) observatory have reported the discovery of the most energetic pulsed emission radiation ever detected from the neutron star in the center of the supernova of 1054 A.D., known as the Crab pulsar. The Crab pulsar is the corpse left over when the star that created the Crab nebula exploded as a supernova. It has a mass of 1.5 the mass of the Sun concentrated in about 10 kilometers diameter object, rotates 30 times per second, and is surrounded by a region of intense magnetic field ten thousand billion times stronger than that of the Sun. This field is strong enough to dominate the motion of charges and forces them to rotate at the same rate as the stellar surface. This region is called the magnetosphere. The rotation of the magnetic field also generates intense electric fields that literally tear electrons from the surface. As these accelerated electrons stream outward, they produce beams of radiation that we receive every time the beam crosses our line of sight, like a lighthouse. 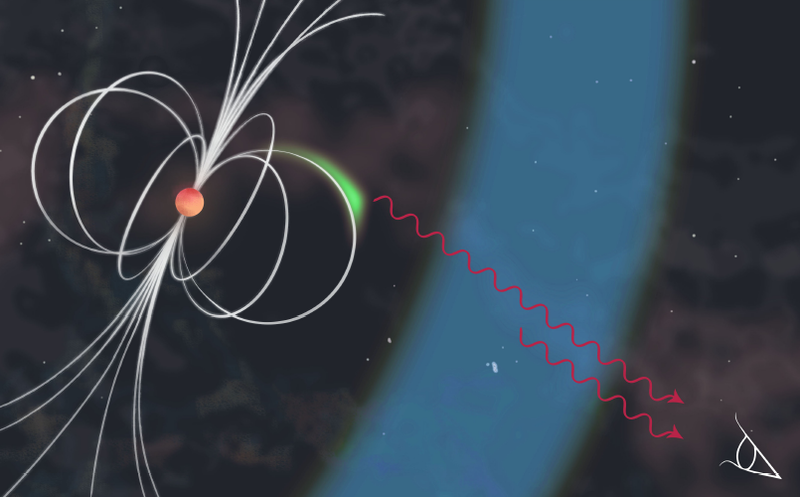 The photons arrive in two precise beams which should be created far from the neutron star surface: on the far end of the magnetosphere or outside it, in the ultra-relativistic wind of particles around the pulsar, to be able to accelerate electrons to such energies and to escape the large absorption in the magnetised atmosphere. But very surprisingly, the TeV beams arrive at the same time as the radio and X-ray beams, which are very likely produced within the magnetosphere. This tight synchronization of the beams at different energies implies that the bright radiation observed in the multi-wavelength spectrum is produced altogether in a rather small region. Alternatively one can say that the electrons responsible from the TeV radiation keep somehow memory of the low energy beams. Daniel Galindo Fernandez (ICCUB-IEEC, Barcelona) says: “Where and how this TeV emission is created remains still unknown and difficult to reconcile with the standard theories.” and David Carreto Fidalgo from Complutense University of Madrid adds: “But how and where this effect is achieved in such a small region challenges our knowledge of physics”. MAGIC Spokeperson Razmik Mirzoyan from the Max Planck Institute for Physics (MPP) in Munich (Germany) says: "This is another very important result achieved by MAGIC on the puzzling celestial object, which incidentally besides the Sun is the most investigated one in all energy ranges. Hence from the beginning of operation of the MAGIC experiment in 2004, we have been intensively observing the Crab Nebula and the Crab pulsar. And that has really paid-off- in the mean time we revealed significant features of this enigmatic object thus providing substantial input to our theory colleagues- now it is their move to explain how the things are at work. MAGIC has been designed to be the most suitable instrument among imaging atmospheric Cherenkov telescopes to perform this kind of observations." The Crab pulsar, created in a supernova explosion that occurred in 1054 A.D., is located at a distance of about 6500 light years at the center of a magnetized nebula visible in the Taurus constellation. The Crab is the most powerful pulsar in our galaxy and it is one of only a few pulsars detected across all wavelengths, from radio up to gamma rays. In its rotating magnetic field, electrons and positrons are accelerated up to relativistic energies and emit radiation that arrives to our telescopes in the form of pulses every 33 millisecond, each time the neutron star rotates and meets our telescopic sight. Before the MAGIC measurement this radiation was believed to stop abruptly when the photons reach a energy few billion times larger than visible light.